Hani Doummar Jewelry comes out shining in this Independence Day ad. "our love for you is 74 carats" (24 scratched). 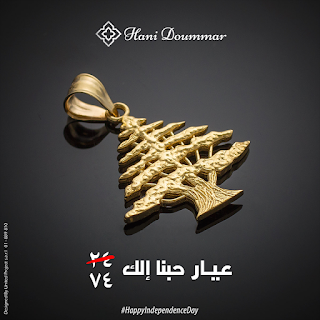 74 refers to Lebanon celebrating its 74th Independence Day. The golden cedar conveys the rest of the meaning in case it slipped from your mind. When you see huge multinationals producing bad ads it is refreshing a local effort got us this one.